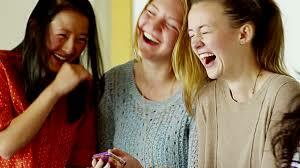 Healthy Teeths tells us the strongness of body and health. The whiteness and health of your teeth depend not only on the basic care but also on the food we eat. 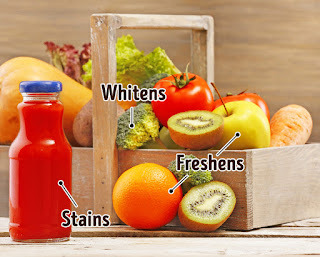 You can see a dentist from time to time and use popular whitening products, but if you like certain foods, that less than perfect smile will keep coming back. 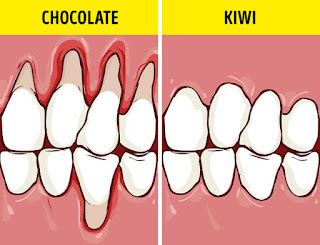 You should pay attention to the foods you eat and how they affect the health of your teeth. Carrots . Carotene is good for the mucous membranes of the mouth and gums. It also makes the tooth enamel stronger. Fresh carrots are a great way to keep your teeth healthy, remove plaque and massage the gums. Fish . 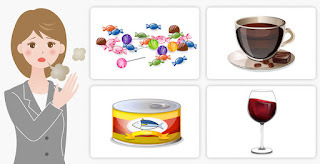 Everyone knows that teeth need calcium, but phosphorus is also one of the most important elements in keeping teeth healthy (but remember that fish can cause an unpleasant odor). Salsa . This is one of the main sources of calcium and in addition, the parsley has a cosmetic effect on the teeth (which we will discuss later in the article). Apples . Apples are incredibly effective when it comes to treating your teeth problems and preventing them. They massage the gums well and remove the dental plaque while letting the breath cooler. Kiwi . This fruit has plenty of vitamin C. If you do not have vitamin C, the production of collagen decreases and the gums begin to bleed. Onion . This is a natural antibiotic that kills harmful bacteria in the mouth. Chicory. Its function is to stimulate blood flow in the mouth. Sesame . Removes plaque very well and makes the enamel stronger. Cheese . Hard cheese has very little salt and too much calcium. Cheese helps maintain the correct pH balance that will not let the bacteria reproduce (some types of cheese may smell unpleasant). Green tea . 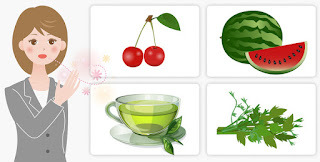 The catechin of green tea kills the types of bacteria that cause cavities. In addition, green tea makes your breath very fresh. The tasty food is great, but dentists are sure that frequent snacks can harm the teeth. If you are constantly chewing something, you feed the bacteria into your mouth. A good thing to do is to wash your mouth even after a little snack. 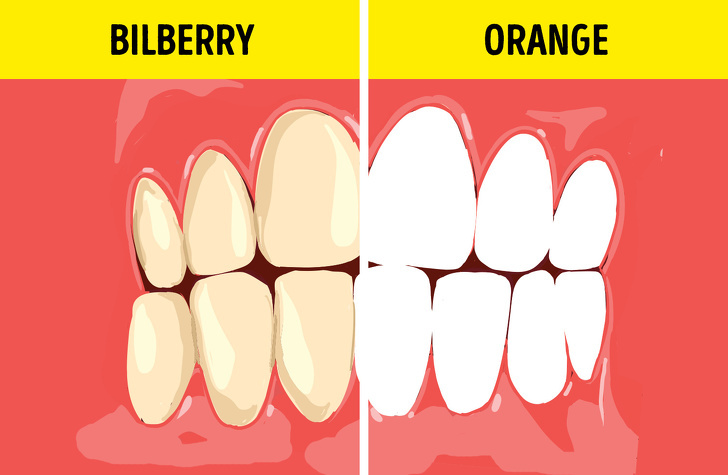 Is the color of your teeth dictated by food? If you do not like the color of your teeth, there are things you can do about it. 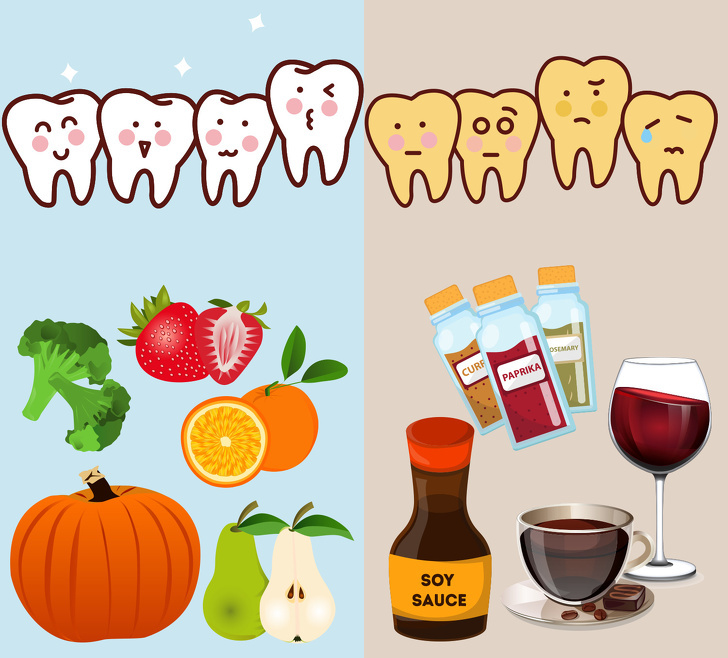 In addition to using different whitening procedures available to you, you should exclude foods that can change the color of your teeth. Tea and coffee . Green and white tea have the least effect on tooth color. Lemon or milk can counteract the effects of these drinks though. Red wine . 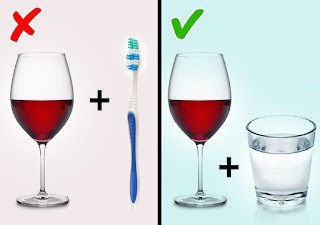 The color of the wine and the high level of tannins make it a champion in changing the color of the teeth. After drinking red wine, you should rinse your mouth with clean water, but do not brush your teeth immediately. Brushing will do more harm than good. Juices . Bright fruit and vegetable juices have such a strong effect because they contain the acid that weakens the teeth and allows the coloring components to be absorbed better. If we eat fruits and vegetables, the saliva is produced more quickly and wash the color that does not happen when we drink juices. Beets and blueberries . 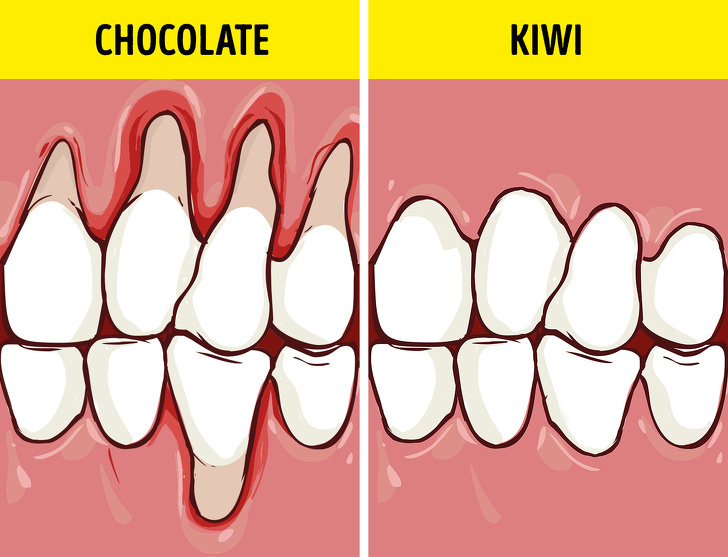 A high concentration of chromogens in these foods makes the teeth yellow. Spices . Curry and saffron are especially good at changing the color of the teeth even after eating them once. They can make your teeth look yellow or even red. It is very difficult to get rid of this color. If you have eaten something that contains these spices, drink green tea with lemon to counteract its effect. Soy sauce and balsamic vinegar . They usually leave dark spots on the teeth. Colorful soda . Soda contains a lot of chemical coloring that changes the color of the teeth. It also destroys the enamel. 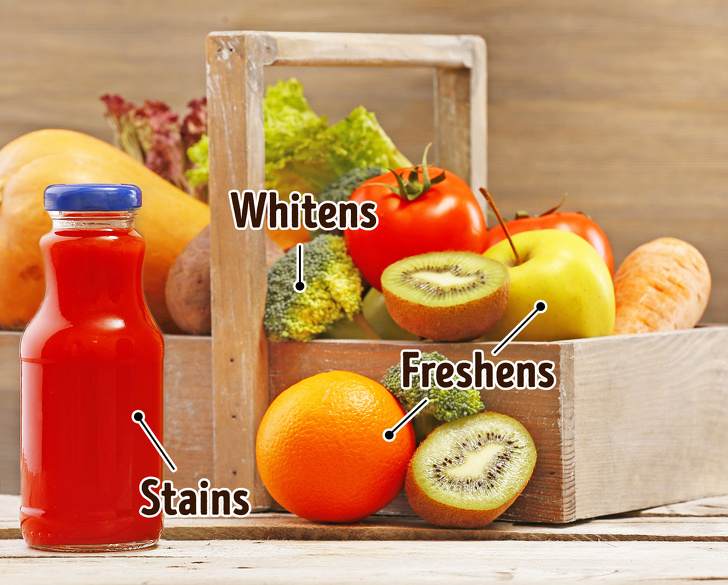 To counteract the negative effects of these foods, wash your mouth after eating and do not forget the natural bleaches. Pear . 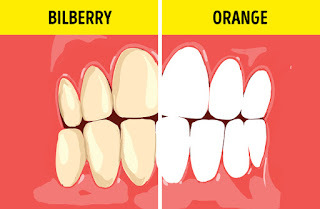 This fruit removes the plaque and massages the gums. Pumpkin . This is one of the best natural whiteners. You can achieve the best effect if you bake in the oven or add it to a salad or smoothie. Strawberry . Despite its bright color, it has a great whitening effect. Contains apple acid that removes dental plaque very effectively. Broccoli . It can remove dark spots very well. It is best to eat fresh broccoli. You can cut it into a salad or boil it a little. Celery . This is a 2 in 1 food whitening. Helps remove dental plaque and kills bacteria in mouth. Orange . 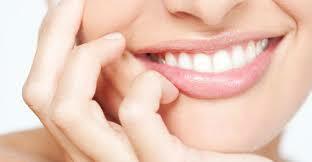 Citric acid whitens teeth very well, but people who have sensitive gums and teeth should be careful. Salsa . 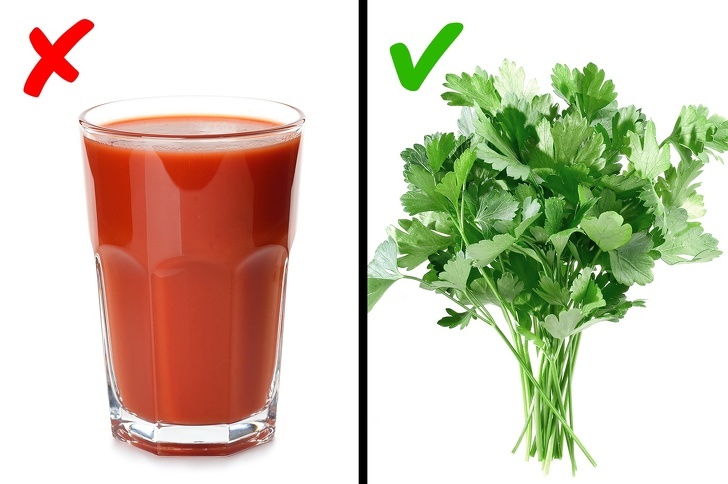 After eating, chew some parsley before washing your mouth. Unpleasant breathing can be a sign of illness in extreme cases, but if you are healthy, it means that you need to make the microflora of the mouth more normal. Certain foods may be causing this bad breath. For example, during the digestion of certain foods, sulfur compounds are produced. They are absorbed by the blood and then leave the body through the lungs. We can smell it unpleasant for a long time after we eat something. Some foods and drinks that appear to have a pleasant smell actually do the opposite, like coffee, for example. They make the mouth mucus dry and increase the reproduction of the bacteria. Try to make some of these changes in your diet and in just one week you should feel the improvement in the condition of your teeth!